Colour vision can be defined as the ability of an organism to distinguish and recognize spectral compositions of light through its visual system. 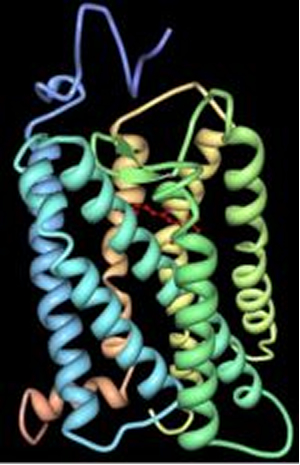 The definition includes at least two necessary conditions of this system: the simultaneous use of at least two different types of photoreceptors and the appropriate neuronal pathway to facilitate this spectral perception. The simultaneously operating photoreceptors are usually cones and the maximum absorption spectra of the photopigments are numerous (e.g. Terai, et al., 2002; Parry et al., 2005). 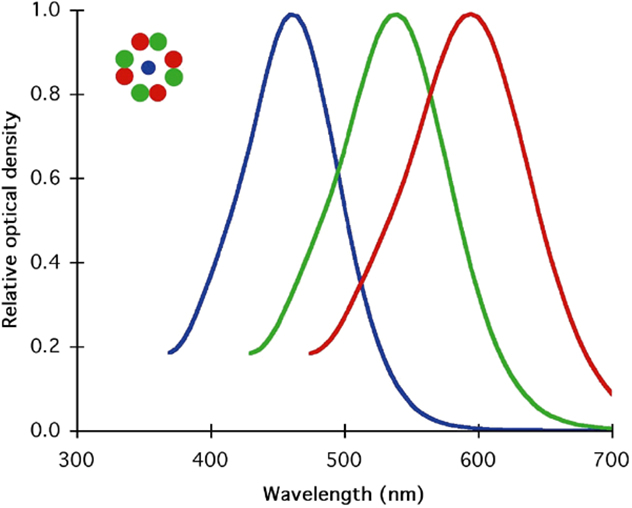 The spectral sensitivity of the photopigments is primarily determined by the amino acid sequence of the opsin protein and, to a lesser extend, by the type of chromophore (Hárosi, 1994; Yokoyama, 1995). The neuronal pathway operates through colour opponent encoding of chromatic information in first-order postsynaptic cells (cone-specific horizontal cells; Stell et al., 1994; Verweij et al., 1996). 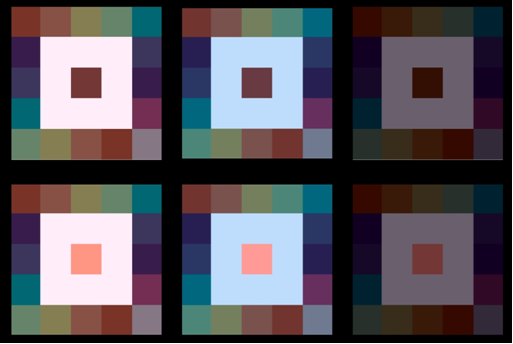 These horizontal cells play an important role in the development of colour constancy, i.e. a detected object generates the same spectral signal regardless of the background light (Masland, 1996). From a philosophical point of view, Thompson (1995) argued “that the biological function of colour vision is not to detect surface reflectance, but rather to generate a set of colour categories that have significance for the perceptual guidance of activity”. In visual science, however, the major biological function of colour vision still is the detection of objects on the basis of their surface spectral reflectance under various conditions (Matthen, 1992; Hilbert, 1992; but see Thomson, 1995). 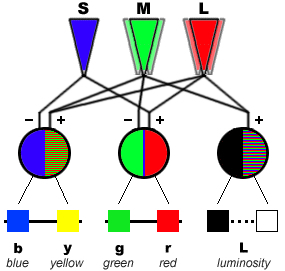 The required colour constancy demands a trichromatic system (Shepard, 1990). This would mean that dichromats are not considered to have true colour vision. Their different visual pigments may serve another purpose (see below). Colour vision is common among vertebrates, with the exception of mammals. Trichromacy was found only in primates and mammalian colour vision seems evolutionarily degenerate (Goldsmith, 1990). Trichromacy and tetrachromacy are common in fish (Neumeyer, 1991), the spectral range extending in cyprinids and salmonids from less than 350 nm to around 800 nm (Bowmaker, 1991). Cichlids are primarily trichromats (Bowmaker, 1990) although they may lose their short-wave sensitivity when migrating to deeper waters (Van der Meer, et al., 1995). The natural habitat of fish, especially of the Lake Victorian cichlids, is a light-limiting environment that easily varies with depth, concentrations of organic matter and seasonal changes. 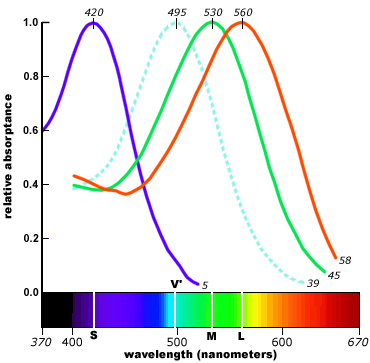 The sensitivity hypothesis (Crescitelli et al., 1985) suggests that the spectral sensitivity of a photopigment may be adapted to attain maximum visual sensitivity in a light-limiting environment. When they have lost their short-wave sensitivity, cichlids may use their double cones to maximize their sensitivity to the ambient light rather than to discriminate colours (Marchiofava, 1985). So, dichromats may have adapted to circumstances where luminosity detection has become predominant over colour vision. More aggravated to particle detection, the contrast hypothesis (Lythgoe & Partridge, 1989) suggests that in the case of dark object against bright background a pigment is most effective if its spectral absorbance matches the colour of the background and in the case of a bright object a pigment should have an absorbance that is offset from the background water colour. Visual segregation implies that specific ecological niches are available to species with different visual properties (cited from Van der Meer & Bowmaker, 1995). Interspecific differences in visual pigments may contribute to this concept of visual segregation. The spectral sensitivities of cones strongly correlate with the spectral composition of the photic habitats of the various species (Bowmaker, 1995). The visual pigments can either be spectrally matched to or offset from the background light, which may lead to different strategies in prey detection (Muntz & McFarland, 1977). Four species of haplochromine cichlids from the Mwanza Gulf of Lake Victoria were studied, comprising the moluscivore H. ishmaeli, and the zooplanktivores H. piceatus, H. argens and H. pyrrhocephalus. The ecological data on these species are based on the fieldstudies by Witte (1981) and Goldschmidt et al. (1990). H. argens had a broad horizontal distribution (bottom-depth 2-30 m) and mainly occurred in the top layer (0-2 m) of the water column. H. pyrrhocephalus had its main distribution in the centre of the Gulf (bottom-depth 8-14 m), where it dwelled at intermediate depths during the day and migrated towards the surface at night. H. piceatus primarily occurred in the shallower `regions (bottom-depth 5-10 m), where it dwelled close to the bottom over a muddy substrate. H. ishmaeli too was a bottom dwelling species though it was mainly restricted to a sandy substrate at 4-6 m.
All studied specimens were adult fishes obtained from the lifestock of the Horniman Museum (London) and belonged to at least the F2-generation of laboratory raised individuals. carried out under either infrared or dim red light. The fish were killed with MS222 and the cornea and lens removed using a binocular microscope with near infrared adaptors. Small pieces of retinal tissue were isolated, briefly fixed in 2% buffered gluteraldehyde for 15 s and rinsed in fresh water teleost Ringer’s solution. All solutions were kept on ice to prevent rapid breakdown of the photopigments. The tissue was fragmented with razor blades and squashed between two cover slips that were then sealed with paraffin wax to prevent evaporation. MSP measurements were made using a modified Liebman microspectrophotometer under computer control (Liebman & Entine, 1964; Mollon et al., 1984). The absorbances of individual outer segments of rods and different cone types were recorded from 750 nm to 370 nm in 2 nm steps and then on return to long wavelengths at the interleaved odd-number wavelengths. Initially, a baseline spectrum was recorded with both beams in a clear area of the preparation, then the absorbance of the cell was recorded, followed by a second baseline spectrum. Both baselines were subtracted individually from the absorbance spectrum to produce two spectra for each cell. A standardized computer program was employed to estimate the wavelength of maximum absorbance (l-max) of each outer segment. 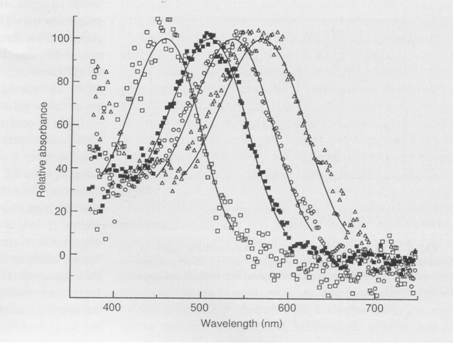 First the two spectra of a cell were averaged and then the absorbance values at pairs of adjacent wavelengths were averaged to obtain a mean curve from the outward and return records. Each of the twenty absorbance values on the long wavelength limb of the curve (corresponding to a 40 nm segment and to absorbances in the range of approximately 45-90% of the maximum of the cell) was then referred to a standard template curve in order to obtain an estimate of l-max. This operation amounts to finding the spectral location of a standard curve that gives the percent absorbance value under consideration. A second estimate of lmax was obtained from the top of the absorbance curve by fitting each of 50 consecutive absorbance points, centred on the highest point, to the template curve and averaging the resulting estimates (for the rationale behind this methodology, see Mollon et al., 1984). Because fresh water fishes often contain mixtures of rhodopsins and porphyropsins (visual pigments with a chromophore based on either Vitamin A1 or Vitamin A2 respectively; Bridges, 1972; Bowmaker, 1990), the templates used for analysis were mixtures of a rhodopsin and a porphyropsin template curve (Knowles & Dartnall, 1977) placed with their lmax at 502 nm and 523 nm respectively. The templates were expressed on an abscissal scale of log frequency, since absorbance curves of visual pigments have almost the same shape when expressed on such an abscissa (Mansfield, 1985; Bowmaker et al., 1991). For each species, the best fitting template figure was determined for the mean absorbance spectrum of the rods (the largest diameter outer segments with the highest transverse density) and this same template mixture was then used to analyse the cones from that species. 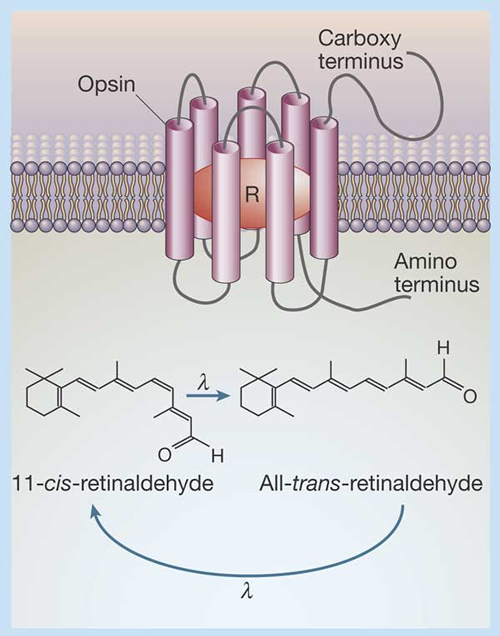 This process assumes that all the photoreceptors within the retina of a given species have the same rhodopsin/porphyropsin ratio. It should be emphasized that this analysis does not claim to establish the true ratio of the two pigments within a class of photoreceptors, but is used solely as an arbitrary way of assessing the lmax. Normally, only records that passed rigid selection criteria were used for detailed analysis. The criteria were i) a transverse density at the lmax greater than 0,01, ii) a standard deviation from the right-hand limb estimate of lmax of less than 10 nm, iii) a short-wave absorbance of less than 50% but greater than 10% and iv) the difference between the two estimates of lmax less than 6 nm. For rods more stringent criteria were employed because of the higher pigment densities, though the criteria had `te be relaxed for the long-wave-sensitive (LWS) and short-wave-sensitive (SWS) cones in H. pyrrhocephalus because of the general low density of pigment encountered in these cells. Haplochromine cichlids have the ability to recognize colours. The lifestock of the Leiden University used to be fed with red coloured items, like tubifex, chyronimus larvae or small pieces of force-meat balls. When these fishes were offered small pieces of wax with different colouration, the fishes clearly preferred the red coloured ones: The red globules had significantly more tooth-prints than the other coloured pieces of wax (blue, green, grey). 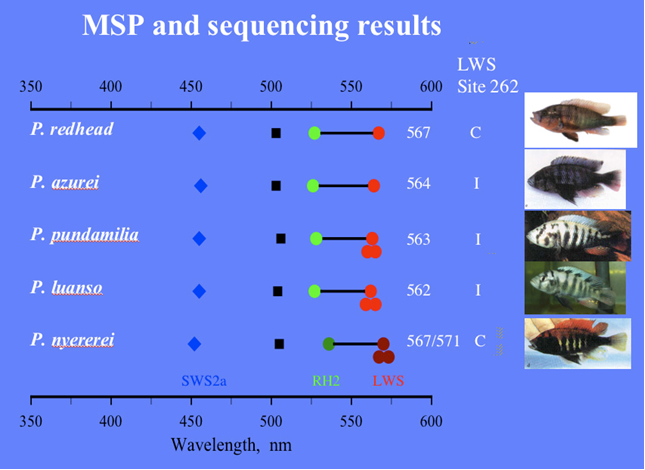 MSP showed that in all studied species the double cones were non-identical with LWS and MWS members, just as previous studies on haplochromines had revealed, whereas the single cones were al SWS. The visual pigments of H. ishmaeli and H. argens appeared to be spectrally identical and similar to those of H. compressiceps (Levine & MacNichol, 1979), with the double cones containing pigments with lmax at about 568 nm and 534 nm, the single cones having a lmax at about 456 nm and the rods with a lmax at about 506 nm. The band widths of the absorbance spectra suggest that these pigments were probably mixtures of rhodopsines and porphyropsins. The lmax of the photoreceptors of H. piceatus were similar to those of H. argens and H. ishmaeli though the MWS component of the double cones had a lmax at about 522 nm (also found in H. burtoni; Fernald & Liebman, 1980), somewhat shorter than that of the other two species. The pigments in H. piceatus were best fitted by a pure rhodopsine template. In contrast, H. pyrrhocephalus was distinctly different with its double cones and rods shifted to significantly longer wavelengths. The double cones had lmax at about 595 nm and 539 nm and the rods a maximum at about 519 nm. Only the lmax of the SWS cones was not displaced from the other species. The long-wave displacement of the double cones and rods was probably primarily a consequence of a higher proportrion of porphyropsins in the rhodopsing/porphyropsin mixtures. Similar variations in lmax have been reported for extracts of visual pigments from cichlids of Lake Malawi (Muntz, 1975). 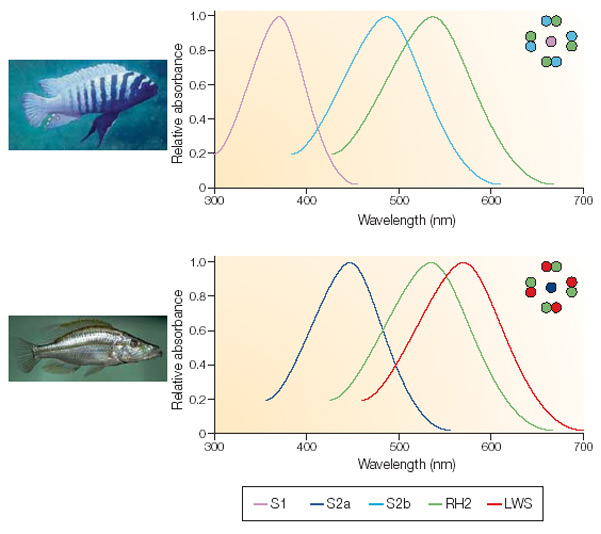 The two species H. argens and H. pyrrhocephalus, with resource coincidence and with the highest encounter frequency, presented the greatest visual differences among the studied cichlids (also with respect to the threshold and acuity of their photopic systems; Van der Meer, et al., 1995). This may indicate that visual segregation (i.e. niche-differentiation due to different visual abilities) contributed towards reducing interference competition among co-existing species with a similar diet. The nocturnal resource competition between H. argens and H. pyrrhocephalus, with low concentrations of prey available, may have been avoided. The different visual capacities of the two species possibly enabled them to follow different strategies of visual prey detection. Innate behavioural studies on these two species revealed a significantly lower photopic threshold in H. pyrrhocephalus in red light (656 nm), whereas no significant different threshold in blue light (436 nm) could be registered between H. pyrrhocephalus and H. argens (Smit & Anker, 1997).This correlates well with their resembling SWS cones and their differing MWS and LWS cones but it was not expected on basis of their cone mosaics. According to Nuboer (1986), the single cones may not contribute to photopic sensitivity. That the photopic threshold entirely depends on the double cones, supports the idea that the principle function of the double cones is luminosity detection rather than colour vision. Colour vision has also been shown to help in mate choice and, on the long run, to conduce to sympatric speciation. Male specimens of H. nyererei showed inherited colouration differences with the sympatric colour morphs “red” and “zebra”, whereas the less conspicuous females favoured males of their own colour morph (Seehausen, 1997; Seehausen & Van Alphen, 1998). The clear preference of a female to mate with a male from their own morph may be related to differences in their spectral sensitivities. Microspectrophotometry revealed a slight difference in the lmax of the LWS members of the double cones among these colour morphs that coincided with the related opsin gene sequence differences and male nuptial colour (Carleton, et al., 2005). Moreover, (innate) behavioural studies showed a difference in spectral sensitivity thresholds: in blue light, the females of the blue morph (Pundamilia pundamilia) performed significantly better than the females of the red morph (P. nyererei) and in red light the pattern was reversed. 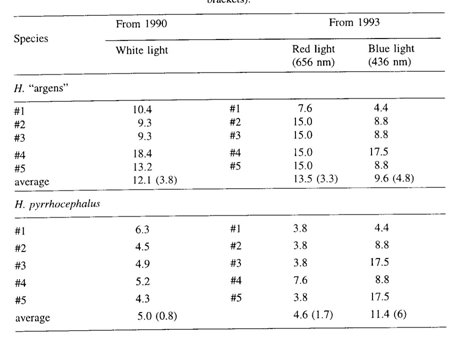 In other words, P. pundamila females responded to lower intensities of blue light than did P nyererei females and, controversely, P. nyererei females responded to lower intensities of red light than did P. pundamilia females (Maan et al., 2006).